Download "[live] As young members, most of us didn t come to. World Service Office PO Box 9999 Van Nuys, CA 91409 USA"
2 [live] Copyright 1983, 2008 by Narcotics Anonymous World Services, Inc. All rights reserved. World Service Office PO Box 9999 Van Nuys, CA USA TEL (818) FAX (818) WEB World Service Office Europe 48 Rue de l Eté B-1050 Brussels, Belgium TEL +32/2/ FAX +32/2/ World Service Office Canada 150 Britannia Road East Unit 21 Mississauga, Ontario, L4Z 2A4, Canada TEL (905) FAX (905) FEL L O W SH IP A P P R O V E D This is NA Fellowship-approved literature. Narcotics Anonymous, and The NA Way are registered trademarks of Narcotics Anonymous World Services, Incorporated. ISBN English 6/08 WSO Catalog Item No. 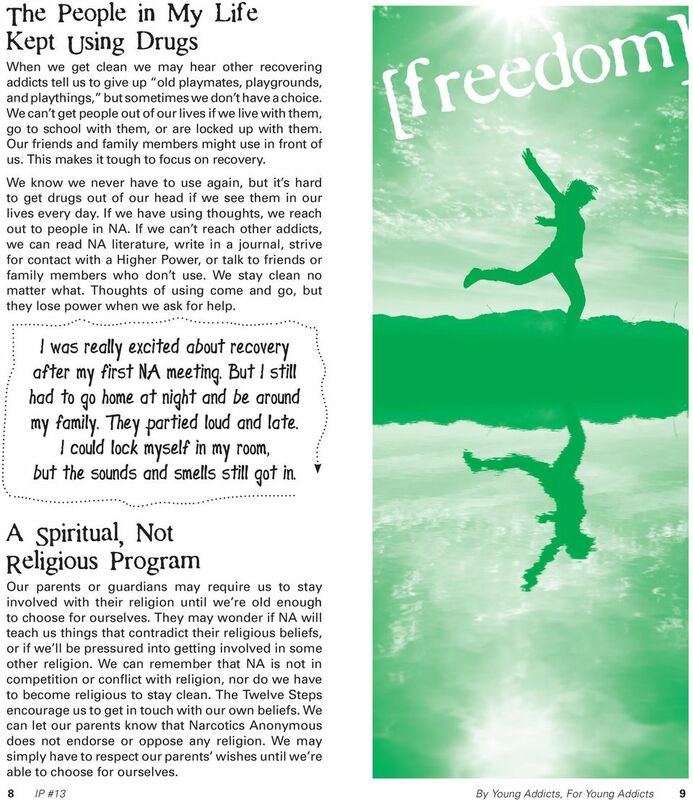 EN-3113 This literature was developed by young members of Narcotics Anonymous who have stayed clean and found a new way of life. 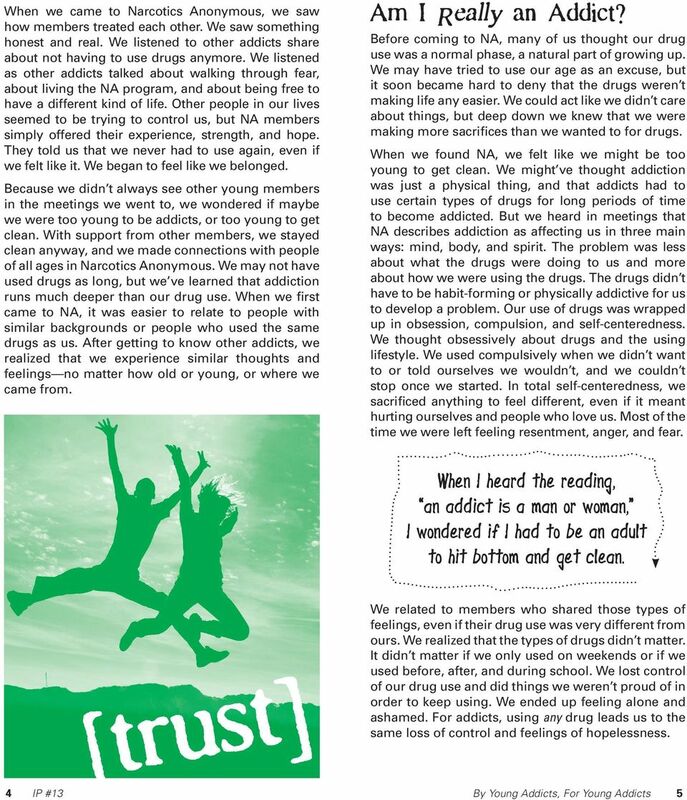 Young addicts around the world, speaking many different languages, are getting and staying clean in NA. We are writing this to share our experience in living the NA message that any addict, no matter how young, can stop using drugs, lose the desire to use, and find a new way to live. 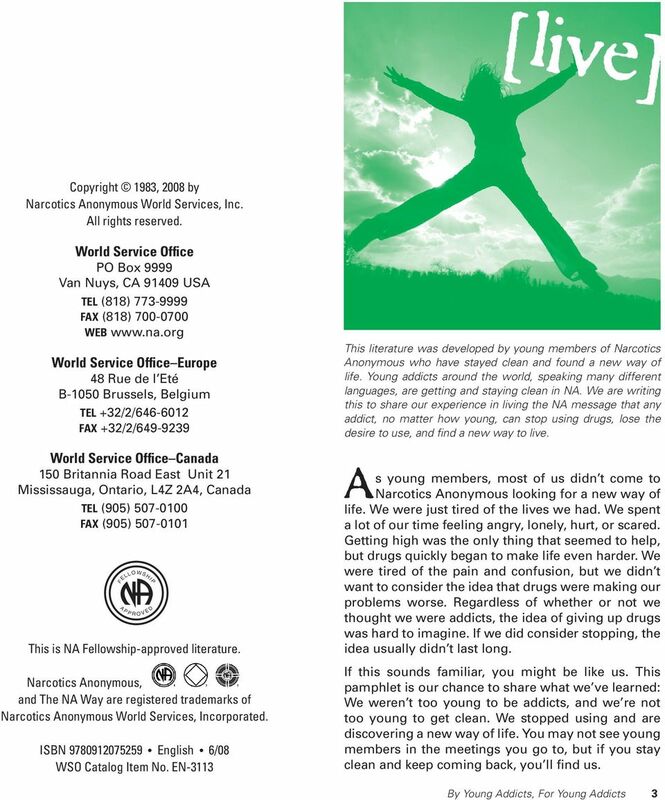 As young members, most of us didn t come to Narcotics Anonymous looking for a new way of life. We were just tired of the lives we had. We spent a lot of our time feeling angry, lonely, hurt, or scared. Getting high was the only thing that seemed to help, but drugs quickly began to make life even harder. We were tired of the pain and confusion, but we didn t want to consider the idea that drugs were making our problems worse. Regardless of whether or not we thought we were addicts, the idea of giving up drugs was hard to imagine. If we did consider stopping, the idea usually didn t last long. If this sounds familiar, you might be like us. 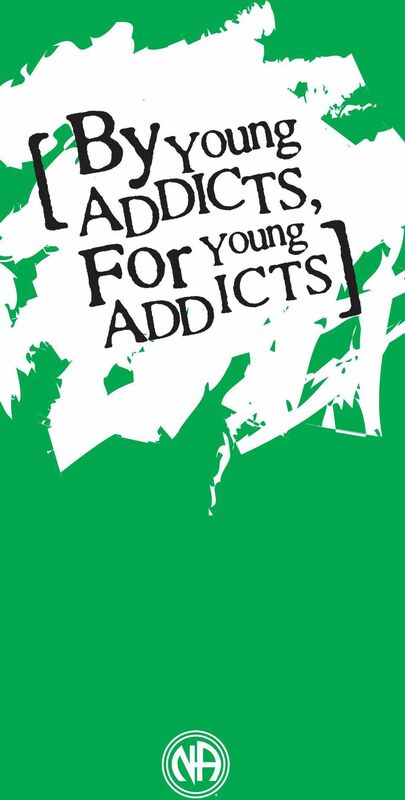 This pamphlet is our chance to share what we ve learned: We weren t too young to be addicts, and we re not too young to get clean. We stopped using and are discovering a new way of life. You may not see young members in the meetings you go to, but if you stay clean and keep coming back, you ll find us. An Introduction to NA Meetings IP No. 29 If you re new to NA or planning to go to a Narcotics Anonymous meeting for the first time, it might be nice to know a little bit about what happens in our meetings. Behind the Walls. This is NA Fellowship-approved literature. Copyright 1990 by Narcotics Anonymous World Services, Inc. All Rights Reserved. For The Bereaved. This pamphlet will give you some valuable information about grief that will assist you in your recovery. FACES of CHANGE. Do I have a problem with alcohol or drugs?